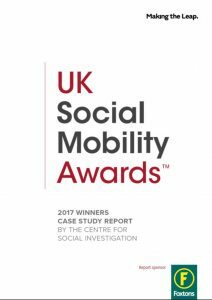 CSI has been of working with Making the Leap and the UK Social Mobility Awards to write up a set of case studies of the 2017 award winners. The full report can be downloaded here. Making social progress is slow work. If we take a long view on social progress in Britain, we can see that we’ve made incredible strides forward in some areas of society. We live longer than we used to, have higher incomes, and more of us are in professional jobs. And yet, despite all this change, patterns of social advantage and disadvantage are persistently replicated through the generations in Britain. The academic research on the topic suggests that being born to working class parents reduces the chances of reaching the top occupations, and that ‘social fluidity’ by this measure is around the same today as it was in post-war Britain. When we are talking about social mobility, therefore, and about the fairness and openness of British society, we are talking about a pattern so enduring that it might feel like a ‘social fact’. It is no small wonder that the people and organisations that set out to ‘make a difference’ can get frustrated with the lack of movement. 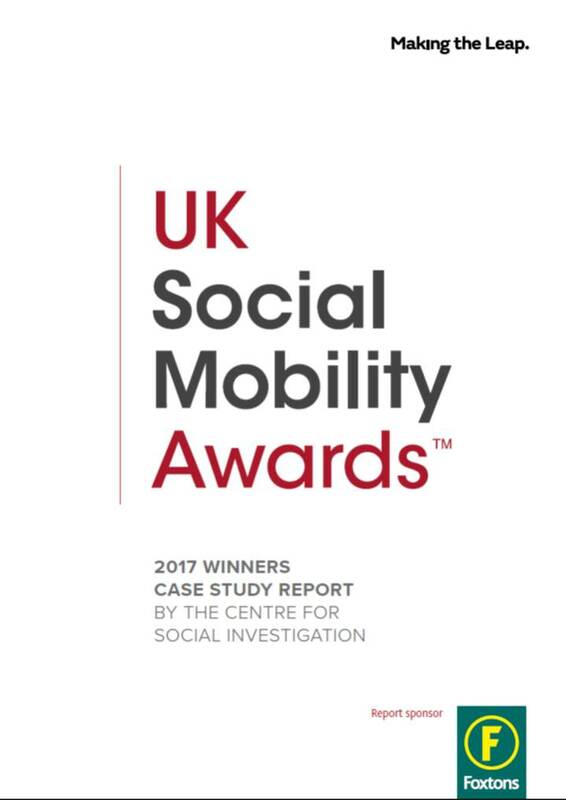 However, if there is a single strand connecting last year’s Social Mobility Award (SOMO) Winners, it is the demonstration that the actions of people and organisations directly improve the life chances of individuals and the fairness of society as a whole. Others have argued before now that private enterprise is a way to make a real difference. While government welfare policy is often considered a ‘safety net’ for the very poorest in our society, it is also apparent by now that we cannot sit around waiting for policy fixes for the inequalities in our society. This has probably never been truer than now. This is an era in which ideas of individualism have taken hold, when most people in British society believe in the modern liberal principles in which hard work and ‘making it on your own’ are prized. Arguably, it has never been more important to emphasise that people who appear to ‘make it on their own’ are often those starting out from positions of privilege. One of last year’s winners – the Civil Service Fast Stream Opportunity Network – has been successful, in part, by encouraging conversations on exactly this point which “just didn’t happen before”. Much of the academic research on ‘social mobility’ defines it rather narrowly in terms of trajectories of movement between income groups or occupational class from parents’ position (origin) to own position (destination). However, the work that is being done by corporations and organisations – the case studies in this report – covers a broader view. Disadvantage comes in many forms. Some of the groups in society that are held back from enjoying the advantages of good labour market positions include: those growing up in poor neighbourhoods, those from poor households, those in long-term unemployment, the disabled, and people who have been in prison and who are looking for a chance to re-build their lives and take care of their families. These are the people being helped by last year’s SOMO winners. A popular idea is that education is the route to social mobility. However, it can never work for everyone: some kids don’t fulfil their potential at school, being limited from achieving by socio-economic constraints and other disadvantageous circumstances. But, the SOMO award winners did not fall into the trap of assuming education is the fix. In their social mobility strategies, most showed awareness of the idea that there is untapped talent even among those who are not achieving a particular level of educational attainment. In doing so, these organisations implicitly demonstrate that they are helping to ‘level the playing field’. Why do we care about social mobility at all? There are two grand theories. The first is about economic efficiency and the potential wastage of talent. If talented people are being prevented from reaching their potential because of their backgrounds, by implication, it follows that less talented people (but from privileged backgrounds) are taking those places. An economic efficiency argument states that we ought to strive for the best-fitting person in every role. If factors such as ethnicity, socio-economic background or other non-relevant qualities are used as criteria in the job market, it stands to reason there is some loss of efficiency. The second argument states that fairness should be a guiding moral principle of societies, and that any economic consequences are irrelevant to this principle. Last year’s SOMO winners were motivated by both of these arguments. “It makes business sense too, we want to be a magnet for talent” KPMG have told us, illustrating the efficiency argument. And on the moral argument: “businesses can be a force for good”, the Wates Group said, “within some of the most pressing issues that society is facing”. We have no reason to suppose that one motivation is better than the other, but where both the moral argument and economic argument send us in the same direction, we can hope that a greater number of organisations will catch on in the future. In the UKSMA report we presented the eleven 2017 winners as case studies. These case studies were compiled based on submission information and on interviews conducted by Sara Mullen in January and February of 2018. We are very grateful that the winners were willing to spare the time to share their experiences with us, resulting in this report which, we hope, will inspire competition entries for 2018. Coming back to our earlier point, making social change is slow work, but these case studies show how much work is already underway, and shine a light on the possibility of a fairer society in which those in privileged positions routinely do what they can to level the playing field for everyone else.